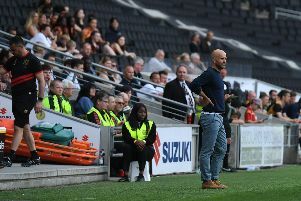 Chuks Aneke came off the bench to earn MK Dons their first away win since November 3 as they beat Newport County 1-0 at Rodney Parade on Tuesday night. Wholesale changes to the side left many questioning Paul Tisdale's selection policy, but a lively looking Dons were a match for Newport, who had lost just three times at home all season. There was an element of good fortune to the victory - Newport hit the frame four times as they tested Stuart Moore's resolve, stepping into the break for dropped keeper Lee Nicholls, while David Wheeler did the same at the other end with a first half strike on the turn. A double change with 15 minutes to go would pay dividends for Dons late on though, with Jake Hesketh's shot saved by keeper Joe Day, only into the path of Chuks Aneke who would tap home from six yards to send Dons back into fourth spot. Following criticism aimed at his defence on Saturday, Tisdale made five changes to the side which lost to Swindon at the weekend, most notably in goal as Lee Nicholls was dropped to the bench in favour of Stuart Moore, who made his league debut for the club. Elsewhere, Ouss Cisse and Callum Brittain came in from the cold, while Conor McGrandles and David Wheeler also returned to the side. Despite the changes though, Dons started brightly. Brittain, Wheeler and Alex Gilbey all had decent sights of goal early on, with McGrandles playing some neat stuff to get them going. At the other end, Stuart Moore made a great stop from Tyreeq Bakinson, but saw Fraser Franks left unmarked only to head over from six yards. The end-to-end nature of the game continued right up to the half time whistle, with both sides going blow-for-blow. McGrandles' hold-up play almost made for the opener on 32 minutes when he controlled on the penalty spot, but patiently waited for the arrival of Wheeler, who spun and got his shot away, only to see it bounce off the base of the post and wide. Newport then thumped the frame themselves when Mickey Demetriou climbed highest at a Newport corner. Back at the other end, Wheeler missed another chance when he fired wide on the turn, before Jamille Matt missed the ball completely when he was left unmarked four yards out. Five minutes into the second half, Bakinson then forced a fine finger-tip save from Moore, deflecting the fierce strike onto the bar. The keeper needed to do better when he came for a deep Newport corner barely two minutes later and got nowhere near it, but Franks' volley come off the post. The frame came to the rescue for a fourth time just after the hour mark when Padraig Amond's header hit the bar. Dons' chances were few and far between in the second period, but Joe Day did well to deny Wheeler for a third time, tipping his effort around the post, while Agard saw an ambitious effort go well wide. Paul Tisdale made a double change with 15 minutes to go, introducing Chuks Aneke and Jake Hesketh into the fray, and the pair played their part with two minutes to go as Dons snatched the win. The excellent McGrandles put Agard in on the right, who in turn picked out Hesketh's run. The Southampton man forced Day into a low save, but he palmed it to Aneke, who was left with the simplest of finished from six yards.